It's no secret periods are a monthly pain in the abdomen many women dread and not only do we have to live with painful cramps and generally feeling meh for a few days every month but mother nature's monthly gift is - shockingly - still considered very much a taboo topic. Enter: Swedish fashion brand Monki - the high-street store are calling bullsh*t on the stigma attached to menstruation by releasing a period-positive collection. It's a well known fact that traditional sanitary products like tampons and pads are bad news - research has proven that they contain highly-toxic bleaches which don't do your body or the world it lives in any favours. Good news then that high-street fashion brand Monki is making a conscious effort to encourage women everywhere to swap their tampons for menstrual cups - while simultaneously breaking down the stigma attached to periods - by launching a period-positive collection. 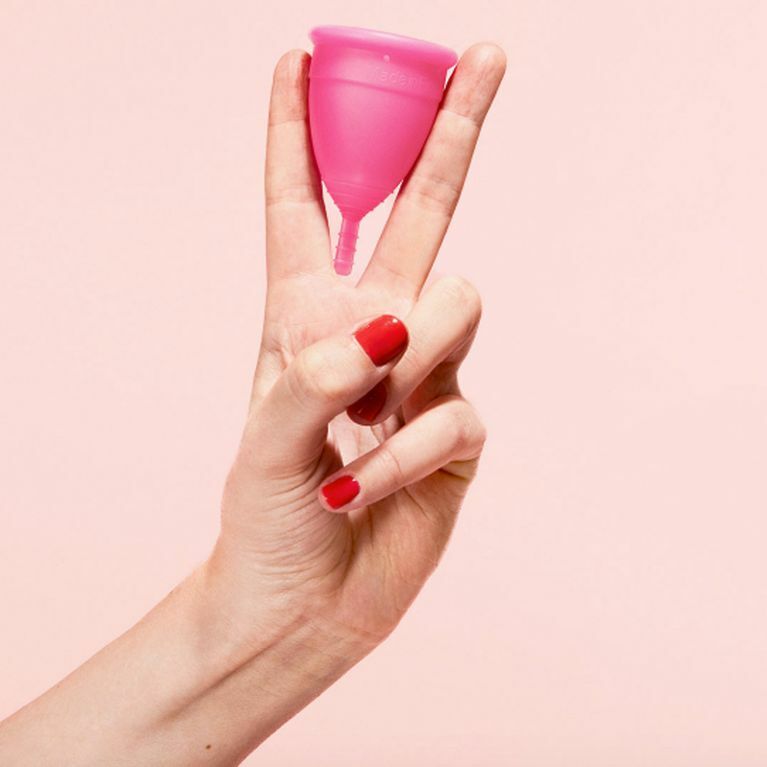 The Swedish retailer, which is part of the H&M group, has teamed up with its Finnish neighbours Lunette - purveyors of 'the best menstrual cup in the world' - for the world first. Unsurprisingly then that a pack of pink menstrual cups are the standout product of the eight-piece collection which also includes customised knickers and decorative pins so you can wear your period pride on your sleeve. If the cups' appropriate-feminine colour way wasn't enough to convince you that cups are cool, maybe the fact they come in a silk, drawstring bag emblazoned with a message that reads 'periods are cool. Period'. In addition to spreading period positivity, Monki will be making a real difference to real lives with its new launch as they'll be donating 5,000 cups to Kenyan charity The Cup Foundation to ensure the girls it supports have the means to live with their periods in a safe and sanitary way. Monki’s Managing Director, Lea Rytz Goldman, said of the initiative: "Female empowerment is at the core of everything we do at Monki. I’m very proud to launch our collaboration with Lunette and The Cup Foundation and to provide young women in Kenya with access to menstrual care and education." Although there's been no confirmation on the exact prices, the full period-positive collection will be available to buy in selected Monki stores and online in mid July. Will you be parting with your pennies to invest in some period merchandise?